One of the stranger stories embedded in mainstream mythology is the [roughly] 210 year de Vries Cycle in solar activity which was discovered by reading the proxy tealeaves provided by ΔC14 in tree rings, Be10 levels in ice cores and dust profiles from ice cores. Direct instrumental observations of the Sun since 1610 have shown that the level of sunspot activity on the Sun has a mean periodicity of 22.3 years, known as the Hale cycle. In addition, these observations of the Sun have shown that there are longer-term periodicities present in the level of solar activity. One of the most prominent long-term cycles that have been identified is the ~210 year de Vries (Suess) cycle. However, because of the limited time over which instrumental observations have been available, the confirmation of the de Vries cycle  has required the use of proxies such as de-trended δC14 from tree rings [2,3], Be10 levels in the GRIP ice cores [4,5,6], and dust profiles in GISP2 ice cores . a) the de Vries cycle amplitude varies with a period of about 2200 years . In other words, its appearance is intermittent in nature. The de Vries Cycle is complemented by the Hallstadtzeit Cycle which is based upon reading the proxy tealeaves provided by detrended δC14 from tree rings. A, as measured in bi-decadal samples of wood (Δ14C) in which the age of the sample is known from counting tree rings (Damon and Sonnett, 1991) for the period from 10,000 calendar years ago to the present. B, Residual (detrended; dashed lines) record of Δ14C in which the long-term secular variation trend has been removed. The heavy red curve is a weighted smoothing function showing Hallstadtzeit Cycles with periodicities of about 2,000 years. The periodicity of both the de Vries Cycle and the Hallstadtzeit Cycle have been refined over the years so that different sources may quote different periodicities. 87 years (70–100 years): Gleissberg cycle, named after Wolfgang Gleißberg, is thought to be an amplitude modulation of the 11-year Schwabe Cycle (Sonnett and Finney, 1990), Braun, et al., (2005). 210 years: Suess cycle (a.k.a. “de Vries cycle”). Braun, et al., (2005). 6000 years (Xapsos and Burke, 2009). Based upon the proxy data and “hypothesized cycles” all manner of solar hindcasts and prognostications have been promulgated. The red line is the C14 production rate, inverted. C14 production is inversely related to solar activity, so we see more C14 production during solar minima. The black line is the percentage of ice-rafted debris in seabed cores of the North Atlantic, also plotted inversely. The higher the black line, the warmer the North Atlantic was. The grey vertical stripes are solar minima. Sadly, these proxy hindcasts and prognostications [of solar activity] are of little value because the underlying ΔC14 and Be10 data are not valid proxies for cosmic rays and solar activity because “atmospheric processes, which play an essential role in the radionuclide precipitation, can violate the relationship between cosmic ray fluxes and radionuclide concentrations”. In the atmosphere cosmic rays produce Be-10, C-14 and other radionuclides. It is commonly supposed that the concentrations of these radionuclides (Be-10 in polar ice and C-14 in tree rings) are good proxies of cosmic ray fluxes impinging on the top of the atmosphere. But before the precipitation on the Earth’s surface these elements spend several years in the atmosphere. The stirring of their concentrations over globe takes place. The analysis of 3 sets of data (2 sets of Be-10 and 1 set of C-14) shows that the correlations between them are low. Also, the relationship between cosmic ray fluxes and Be-10 concentrations in the period of 1937 – 1985 when there are direct cosmic ray flux measurements is weak. It means that the atmospheric processes, which play an essential role in the radionuclide precipitation, can violate the relationship between cosmic ray fluxes and radionuclide concentrations. Do Be-10 and C-14 give us the information about cosmic rays in the past? Additionally, a major problem with regional proxies [such as Greenland Ice Cores, South West US Bristlecone Pines and Irish Oak Trees] is that they are not global proxies. The regional nature of tree-ring records was clearly demonstrated 95 years ago by A. E. Douglass. The regional nature of ice core records is clearly demonstrated by the trends in polar sea ice [between 1978 and 2012] which are not globally synchronised. Furthermore, the official atmospheric ΔC14 dataset appears to have a strong regional bias that is focussed upon supporting the official Irish Oak Tree chronology. Atmospheric neutron flux, apparently from thunderstorms, can reach levels of 3•102 to 5•102 neutrons per cm2 per sec. Nuclear interactions of cosmic rays in the atmosphere generate about 6 × 104 neutrons s−1 per m2 of the Earth at 45° latitude, of which 4 × 104 m−2s−1 are absorbed by nitrogen to generate 14C when solar activity is low: the long-term all-Earth average would be about 60% of this. 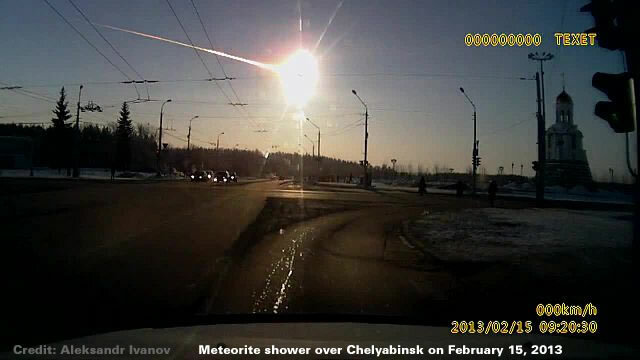 The Chelyabinsk meteor was a superbolide caused by a near-Earth asteroid that entered Earth’s atmosphere over Russia on 15 February 2013 at about 09:20 YEKT (03:20 UTC), with a speed of 19.16 +/- 0.15 kilometres per second (60,000 – 69,000 km/h or 40,000 – 42,900 mph). It quickly became a brilliant superbolide meteor over the southern Ural region. The light from the meteor was brighter than the Sun, even at 100 km distance. It was observed over a wide area of the region and in neighbouring republics. Eyewitnesses also felt intense heat from the fireball. Due to its enormous velocity and shallow atmospheric entry angle, the object exploded in an air burst over Chelyabinsk Oblast, at a height of around 29.7 km (18.4 miles, 97,400 feet). The explosion generated a bright flash, producing a hot cloud of dust and gas that penetrated to 26.2 km, and many surviving small fragmentary meteorites, as well as a powerful shock wave. The atmosphere absorbed most of the object’s energy, with a total kinetic energy before atmospheric impact equivalent to approximately 500 kilotons of TNT (about 1.8 PJ), 20–30 times more energy than was released from the atomic bomb detonated at Hiroshima. With an estimated initial mass of about 12,000–13,000 metric tonnes (13,000–14,000 short tons, heavier than the Eiffel Tower), and measuring about 20 metres in diameter, it is the largest known natural object to have entered Earth’s atmosphere since the 1908 Tunguska event that destroyed a wide, remote, forested area of Siberia. Therefore, there is a strong possibility that the de Vries Cycle is actually a series of de Vries Events associated with [one or more] meteor showers that regularly recur. The concept of de Vries Events is strongly supported by the carbon-14 dating of the sand and gravel that buried the Farm Beneath the Sand in Greenland. The radiocarbon dating clearly displays three flooding events that [each] deposited about 50 mm of sand and gravel on top of the buried the Farm Beneath the Sand. The site investigated is known as, ‘The Farm Beneath the Sand’ (GUS) and is located in south-west Greenland on a plain surrounded by low mountains c . 80km east of Nuuk. The building remains were found in 1990 covered by c . 1.5m-thick layers of sand and gravel (Andreasen & Arneborg 1992a & b; Schweger 1998: 16-17). Today this area appears as a sandy desert intersected by meandering watercourses draining the icecap. At the time of Norse settlement the scenery must have been quite different, offering grass for fodder production as well as easy access to clean water. 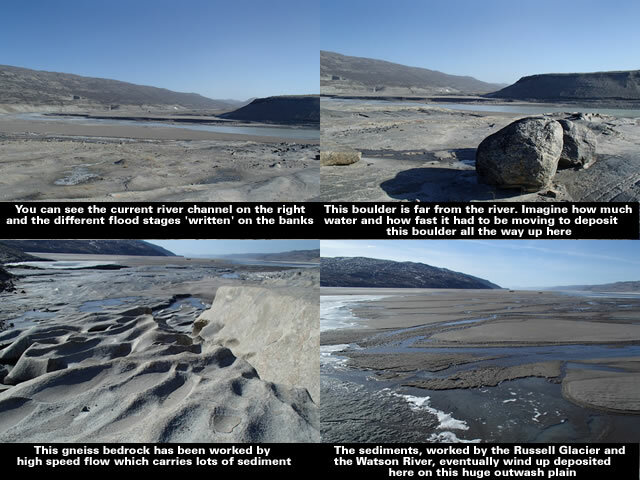 The above photographs clearly show the broad flood plain and thick layers of sand and gravel through which the regular summer melt water currently meanders. 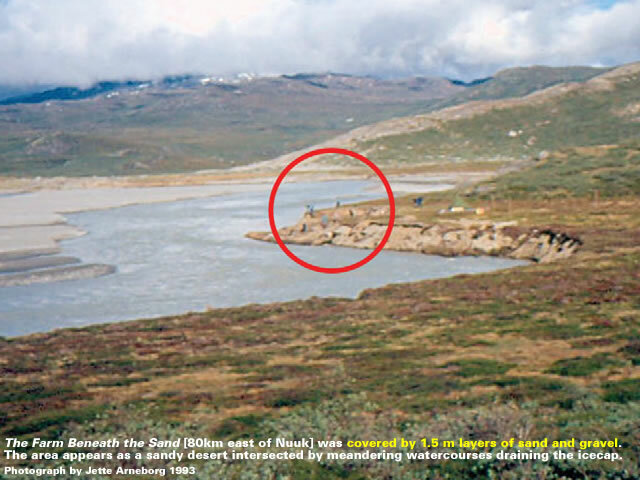 Unsurprisingly, the Watson River [which is fed by the Russell Glacier] also demonstrates that significant flooding events [contrary to expectations] occur in Greenland. Russell Glacier (Danish: Russells Gletscher) is a glacier in the Qeqqata municipality in central-western Greenland. It flows from the Greenland ice sheet (Greenlandic: Sermersuaq) in the western direction. The front of the glacier is located 25 km (16 mi) east of Kangerlussuaq. It is active, advancing 25 m (82 ft) every year, and due to easy approach it remains a popular tourist target. Unsurprisingly, very large meteorites have been found in Greenland. Returning to the official atmospheric ΔC14 dataset it appears the last de Vries Event occurred in 1700 AD. 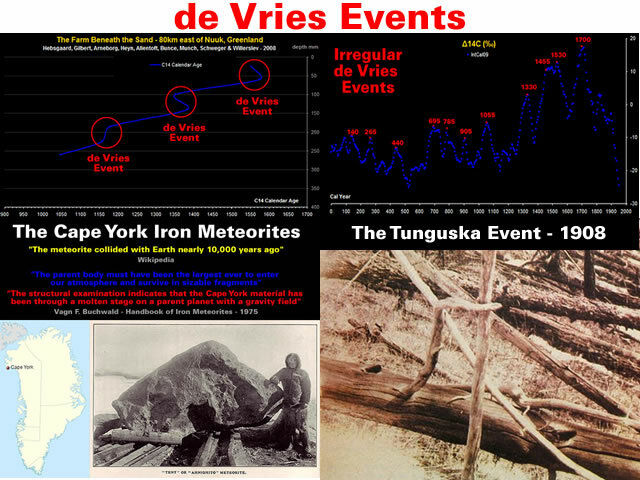 If we allow for Ian Wilson’s “more precise estimates” for the de Vries Cycle as “being in the range 207-208 years” then we arrive at 1908 AD and the Tunguska Event. 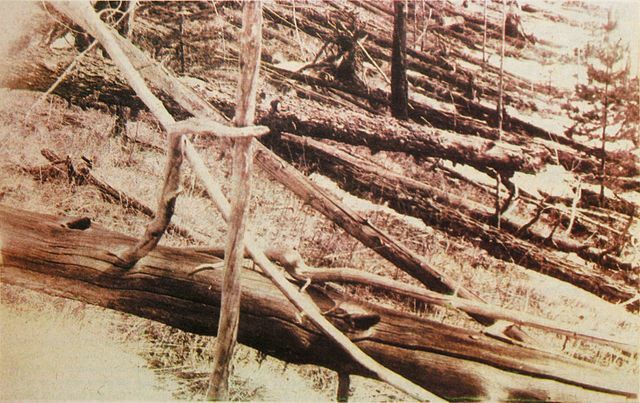 The Tunguska event was a large explosion which occurred near the Podkamennaya Tunguska River in what is now Krasnoyarsk Krai, Russia, at about 07:14 KRAT (00:14 UT) on June 30 [O.S. June 17], 1908. The explosion occurred at an altitude of 5–10 kilometres (3–6 mi) at 60.886°N, 101.894°E. It is classified as an impact even though the asteroid or comet is believed to have burst in the air rather than hit the surface. Different studies have yielded widely varying estimates of the impacting object’s size, on the order of 60 m (200 ft) to 190 m (620 ft). It is the largest impact event on or near Earth in recorded history. This image is cropped from the original, taken in May 1929 during the Leonid Kulik expedition. Based upon this interpretation of the ΔC14 record the Earth will be playing a cosmic version of Russian Roulette with a de Vries Event around 2116. However, a review of the atmospheric ΔC14 dataset suggests there may well be other periodicities associated with de Vries Events. Therefore, a de Vries Event may occur [out of the blue like the 2013 Chelyabinsk meteor] at any time. Gallery | This entry was posted in Catastrophism, Cosmic Rays, Dendrochronology, Greenland, Heinsohn Horizon, Radiocarbon Dating. Bookmark the permalink.